Why does compressed air need to be filtered or dried? You can’t avoid generating water when you compress air. Though not readily visible, water vapour is present in the atmosphere. The amount of water vapour in the atmosphere depends on temperature and relative humidity. Air compressed to 120 psi, the average compressor range, is roughly 8 times atmospheric pressure. Therefore one cubic foot of compressed air has 8 times the water vapour of atmospheric air. Depending on temperature and humidity it could mean alot of water being produced by your compressor. As a result, even on a cool day that’s a lot of water! That water will rust your air tank and air lines. The air coming into your compressor is also filled with dirt – especially in an industrial environment. That is why it so important to change intake filters regularly. This dirt mixes with the “blow-by” oil from a piston compressor and fine particles of oil from a rotary screw compressor. This mixes with the rust in your tank and lines. 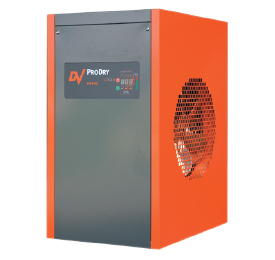 In addition to this most piston compressors run hot (~300F)and therefore you have a mixture of HOT oil, dirt, and rust sent down your air lines. Leaving deposits (impeding air flow) and making its way to your tools, regulators, valves, and air operated components. This leads at least to inefficiences in your system (costing you money in wasted energy) and at worst to failures (costing you even more money in lost production time). How much did it cost to install you air lines? How much are your air tools worth? Regulators, valves, components? Proper air treatment equipment reduces or eliminates these problems. Another reason for air treatment equipment is that it is simply necessary to have clean, dry air (painting, printing, specialized machines, breathing air). One very popular and effective solution for water and moisture removal is to install a refrigerated air dryer. These units cool the air which releases the water, up to 99.9%. If absolutely dry air is not necessary, then a water separating filter can be used. It is designed to use centifugal force to separate out the water (40%-50%) in addition to a filter element to take out oil and dirt. A new trend is a dry air tank (see C15TD). The air is compressed then is filtered to .5 microns, then goes through a refrigerated air dryer, then is stored in the tank, from there it goes to the plant. Click on an image below for further information. Call us to discuss your compressed air needs at 705-722-5747 or email us using the form below.